BREWER, Maine — One of the youngest lineups in Class A boys basketball this winter is being fielded at Brewer High School, with one sophomore and two freshmen among the Witches’ starting five. Such lineups typically endure growing pains while also experiencing significant improvement, and coach Ben Goodwin’s club is no exception as it prepares for the final third of its regular-season schedule. 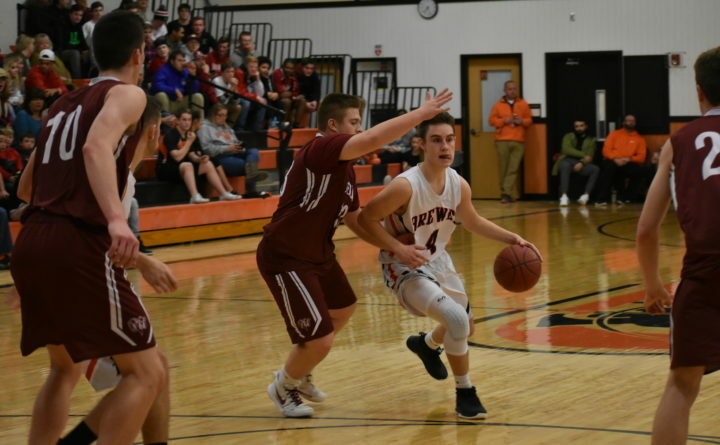 Despite a 62-46 loss to defending regional champion Hampden Academy on Thursday night, Brewer has won four of its last seven games after a 1-5 start. The Witches (5-8) are battling Medomak Valley of Waldoboro for the eighth and final tournament slot. Brewer is led by senior guard Brandon Glidden and junior forward Trevor Pearson, who has emerged as its top inside threat. They are joined in the starting lineup by forward Dylan Huff — one of five sophomores on the 15-player varsity roster — and freshman guards Colby Smith and Aaron Newcomb. The latter trio combined for 20 of the Witches’ points against Hampden. Thursday’s rematch also proved much more competitive than Hampden’s 71-39 home-court victory over Brewer on Dec. 21, as the Witches remained within single digits late in the third quarter before the Broncos pulled away. Huff and Pearson paced Brewer’s offense with nine points each. “When you start two freshmen and a sophomore and it’s their first year starting you can make some big strides and I think they have,” said Hampden coach Russ Bartlett. “I thought the first time we played our guards were able to bully their guards, but not tonight. They did a better job. Brewer has been solid defensively during its last six games, allowing just 50.1 points per outing. Continued improvement likely will come at the offensive end, though the Witches have averaged 59.9 points in their last three contests. “The biggest thing is we’re getting more consistent,” said Goodwin, whose team fell to No. 6 Messalonskee of Oakland 60-49 on Saturday. With more promising young players set to reach the high school level in the coming years, the Brewer boys basketball program boasts some long-term optimism. But for veterans like Glidden and Pearson the future is now, so the Witches hope to make the most of their final six regular-season games and earn their way to a tournament appearance at the Augusta Civic Center come mid-February.